Blast Live, The Scottish Music Shop - The Best Selection of Scottish CDs and Scottish DVDs. Storming onto the stage the Red Hot Chilli Pipers Live are an unstoppable force! An Abundance of Energy with all the power of the Scottish Bagpipes times three and an amazing Rock Band enhanced by Brass, Pipes & Drums and the Red Hot Chilli Dancers; an unforgettable and unique sound. Modern Classics and Rock Anthems are fused with all the adrenalin rush created by their passion for the Pipes. 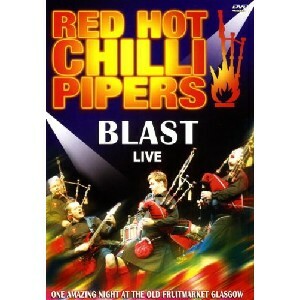 This DVD Blasts the Bagpipes into a new musical orbit and ensures that the Chilli Pipers stars burn bright for all to see and enjoy. One Amazing night in One Amazing Venue.